And it came to pass that the summer did come and the land was filled with the heat thereof and the heat begat the fruiting of the tomato vines and the vines of all the land were lush with many tomatoes everywhere. And the people were overjoyed that tomato season was once again in the land and they rejoiced with abandon and went from plant to plant, picking the tomatoes and many eating from the vine right where they stood relishing the deliciousness of the fruit warmed by the sun, sweet and succulent in its ripeness. And lo, they came unto one plant with fruit a different color than they were used to, for though tomatoes have many colors, most are red or yellow, but this one was orange to the eye and appealing and many said to themselves, we have never seen a tomato like this tomato and they marveled at its color, but not so much that they did not eat the fruit. And when they had eaten the fruit they looked at one another and said, this is the bomb, behold an orange tomato that is sweeter than a Reeses Piece yet is a tomato! And they went with their discovery to the Wise Man in charge of the garden, verily, the one they call the Gardenmaster and they said unto him, look what we have found! And the Gardenmaster, because he was wise and knew about orange tomatoes from a long time before, was not impressed and verily did say to them that had gathered, This is an orange tomato. So what. 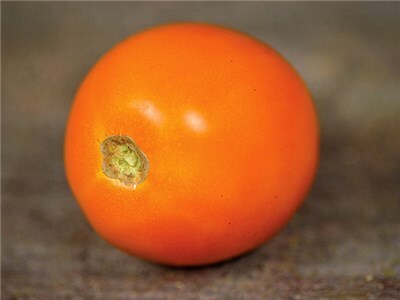 Verily, they said unto him, loud with one voice, you must taste this orange tomato for there is none other tomato like it. And they offered him a fruit, which he did take and then saith, Why yes, that is pretty yummy. And then the people pressed him pointing to the bush that brought forth such alluring fruit, From whence cometh that amazing tomato plant? And he spoke to them replying, It came from Nan. And they all marveled and said with one voice, Nan? Nan, replied the Gardenmaster, Nan came from afar and did plant that tomato plant which bears the orange, and quite tasty, fruit. Oh, all the people said, who could this Nan be that she would bring to us such a fruit and leave it for us to eat and partake – what a wise and benevolent soul this Nan must be! And they talked among themselves in wonder and amazement who this Nan could be, so they turned to the Gardenmaster and spoke to him saying, Tell us all about this Nan. And he said unto them, she is a fair and lovely maiden, beautiful and gracious and they said unto him, surely she must be rich beyond all measure and something truly extraordinarily different that sets her apart from all other fair and loving maidens. And the Gardenmaster thought for a time and finally said unto them, Well, she IS Canadian. And the people spoke among themselves with awe wondering what kind of wonderful and mighty place this Canadia must be that they grow so many delicious tomatoes that one of them could come to this garden and plant a tomato like this tomato. But one among them was not impressed – he said unto them, I know several Canadians, they are just like Americans, only civilized. Verily they have civilized health care with no waiting lines and they have a peculiar adaptation of English, but they are thoughtful and have made a nation on the glaciers of North America. Now the people were mystified greatly. Who could this Nan be that she would could plant such a marvelous tomato in their midst and leave it for others to enjoy, verily, not even returning to try the fruit, but to leave is if it were abandoned.. And so they pressed close to the Gardenmaster and they spoke unto him demanding an answer. Why would this fair maiden give unto them this plant? And he tried to evade them by shrugging his shoulders, but they would have none of it. Tell us, oh, tell us, Gardenmaster, they chanted in unison, Tell us. And he tried to reason with them, saying, I don’t know why she hasn’t come back, but they would not hear him. Finally, in desperation, he cried out to them, All right, all right, I shall email her and ask her why she has not come back to partake of the fruit of her tomato. 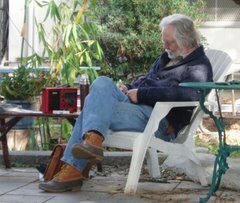 And verily, quieted, the crowd was satisfied and in the wholeness of time the Gardenmaster did send an email to Canadia to ask Nan to come and join the frolicking in the garden in the summer of that year. Sadly, upon all our hearts, did the email truly bounce.